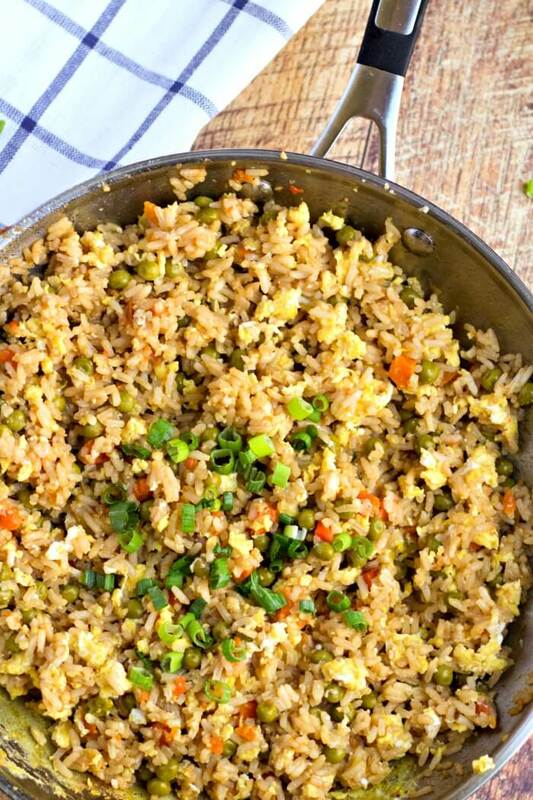 This is the BEST easy Fried Rice! It is so simple to make and delicious to eat! Fried rice is a second-day dish in our house. Meaning, on the first day I make white rice as a side, and on the second day, we use the leftovers to make Fried Rice. Mmmmmm… It’s fantastic. Sometimes though, I just make fried rice. No waiting necessary! We like to serve fried rice with honey garlic chicken, stir fry, and roasted broccoli. 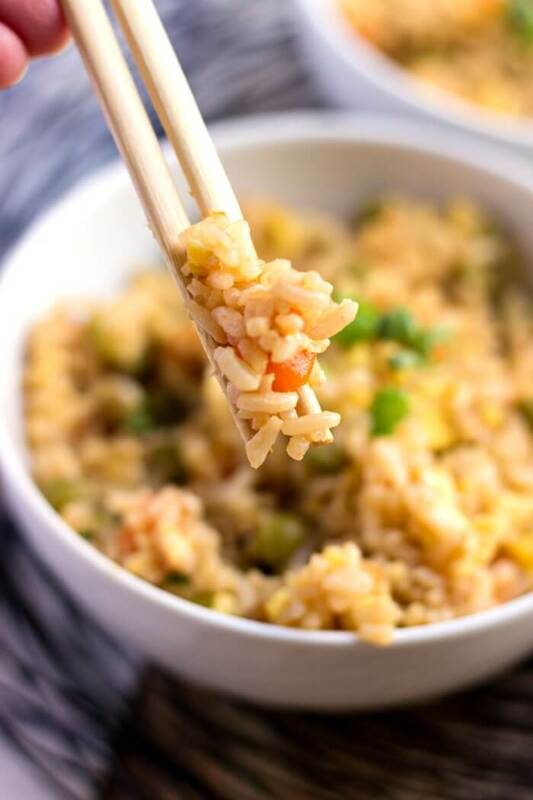 Rice – My preference for fried rice is to use white rice. The best rice is leftover white rice that has been stored in the refrigerator for at least overnight. You want your rice to be a little bit dried out when you start so the end result isn’t soggy. Butter – Any oil will work, but butter gives the best flavor. It’s why you see the Hibachi chefs use butter when they cook on the teppan! 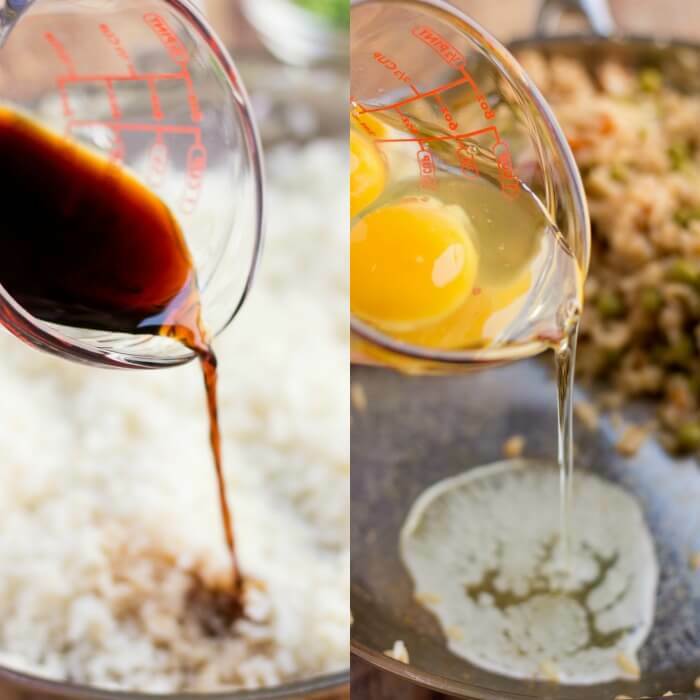 Soy sauce – Soy sauce is what gives this rice it’s authentic fried rice flavor! I love to add a little extra dash at the end. 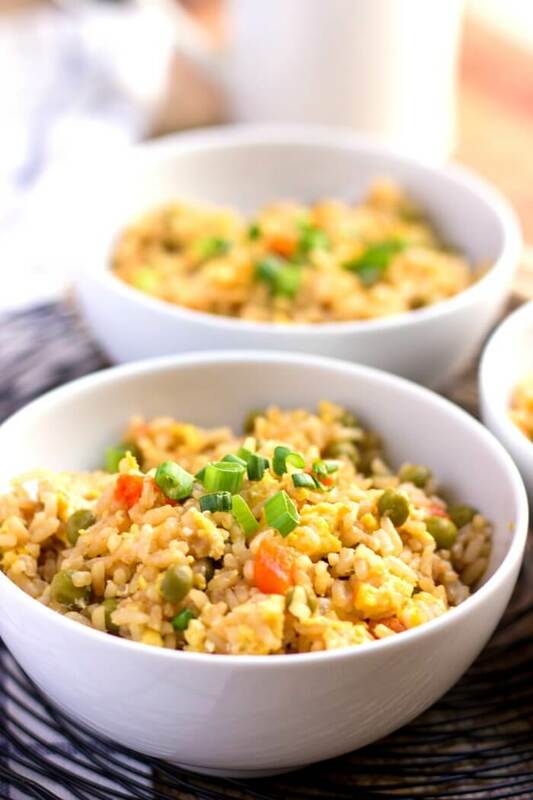 Garlic – A little bit of minced garlic brings a great flavor to this fried rice. You can use squeeze garlic or garlic from a jar if you don’t have fresh garlic. In a pinch, a little bit of garlic powder will work as well. Ginger – Ginger is one of my favorite additions to this recipe. Like with the garlic, if you don’t have fresh ginger, most grocery stores have a squeeze tube in the produce section. Eggs – It wouldn’t be fried rice without eggs! Make sure they’re cooked through before folding the eggs into the rice to avoid making the rice too mushy. Veggies – I’m a total cheater when it comes to the vegetables. You could absolutely mince carrot and get fresh peas, or even use frozen, but honestly can of peas and carrots works perfectly in this recipe and is so easy. Sesame oil – This isn’t a make or break moment, but I think adding a drizzle of sesame oil at the end adds so much authenticity of flavor. Yum! Green onion – Green onion or scallions added at the end gives a nice bright finishing note. 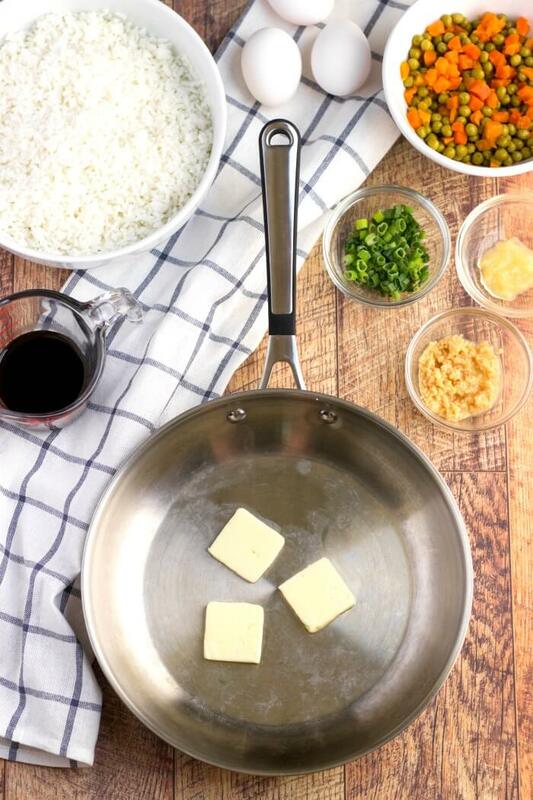 First melt your butter in a medium high heat pan or wok on the stove top. I love using my everyday pan, or my huge cast iron pan if I’m making a double batch. Once the butter is melted and hot, add garlic and ginger. Saute for a few minutes, until fragrant. Next, add cold pre-cooked rice to the pan and mix well until heated through. Pour in soy sauce and mix, then peas and carrots. Then push rice to one side of the pan, and in the empty side, crack your eggs. Scramble the eggs and break them up into small pieces. When they are cooked through, stir into the rice. Finish by garnishing with green onion and a drizzle of sesame oil. 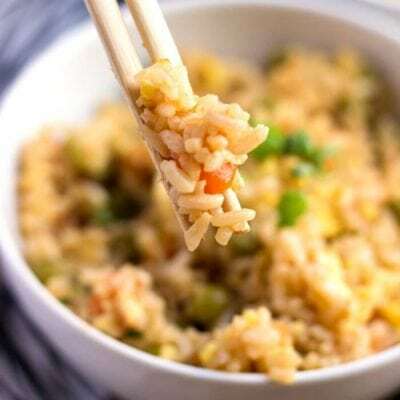 How to make the BEST Fried Rice – Tips! Make sure your rice is fully chilled. I like to make mine at least a full day before. This will keep your fried rice from becoming wet, mushy, and too starchy. You know how leftover Chinese food rice is the day after it’s been sitting in the fridge? A little but dry and almost crunchy in some bits? That is the perfect rice for making fried rice! Cook the eggs separately. You don’t have to remove the rice from the pan while you cook the eggs, just scooch it all over to one side. But make sure the egg is cooked through before you stir it all together, otherwise you’ll just end up with a sticky eggy mess. Don’t fry with sesame oil, finish with sesame oil. The best fat to cook the rice in is butter, but you still want that Asian sesame oil flavor, so make sure to drizzle a little bit on at the end. Add the aromatics. Garlic, ginger, and then ending with green onions. These are the little things that will make your fried rice stand apart from others. 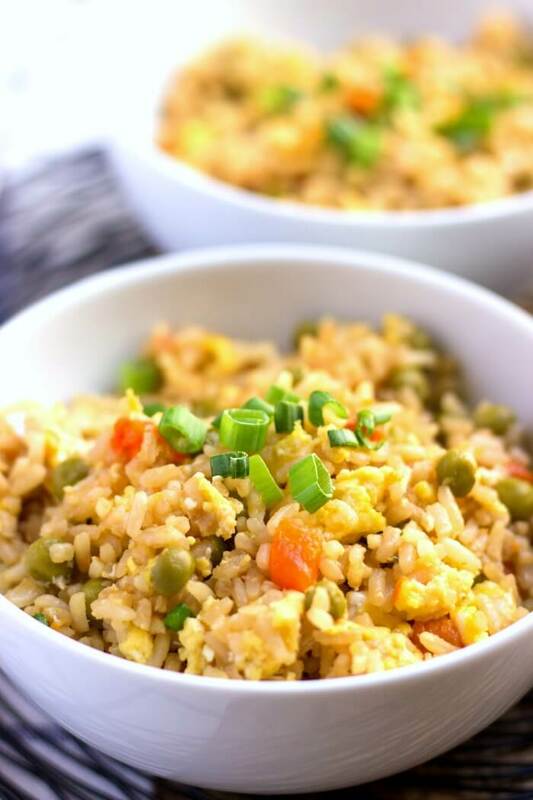 Fried rice is healthy if you are consuming a diet that includes grains, fats, protein, and vegetables. This recipe contains 3.2 grams of dietary fiber, and 13.8 grams of protein per serving. 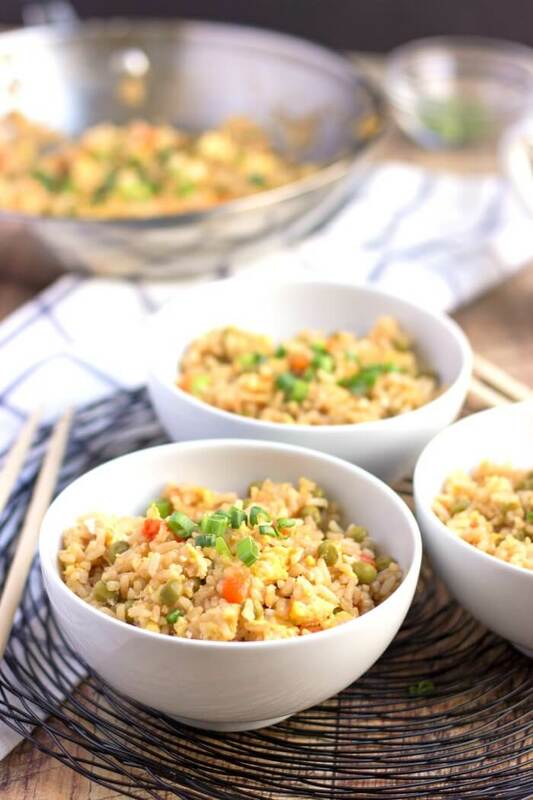 If you wanted to make it more healthy or grain free, you could prepare this fried rice with our cauliflower rice. To add more protein you could stir in some baked chicken. To bring down the sodium levels, use a low sodium soy sauce. Fried rice is gluten free if you make sure to use a gluten free soy sauce. Many commercial soy sauces contain gluten. Make sure to check the label closely if you are trying to make gluten free fried rice. It is also important to note that many gluten free soy sauces are saltier in flavor, so be careful not to add too much without tasting it first. Add some chopped baked chicken for a quick chicken fried rice dish. Go tropical with pineapple and spam for a Hawaiian fried rice. Make it spicy with a swirl of sriracha sauce at the end. Seared scallops and shrimp are perfect for a seafood fried rice. 4 cups cooked/cold white rice instant rice works fine, just make sure to fully chill it after it is cooked. In a large skillet or wok, bring butter to medium/high heat. Add garlic and ginger, stir for 1 - 2 minutes until fragrant. Add rice and cook until heated through. Stir in soy sauce, and add peas and carrots. (If using raw carrots, cook until tender). Push rice to one side of pan, and crack eggs in other side. scramble eggs and cook through. when they’re done cooking, stir into rice. Finish with green onion and a light drizzle of sesame oil. And that’s when you eat fried rice… lol… because it’s cheap? Okay, sorry… I couldn’t resist :p Thanks for making me smile. 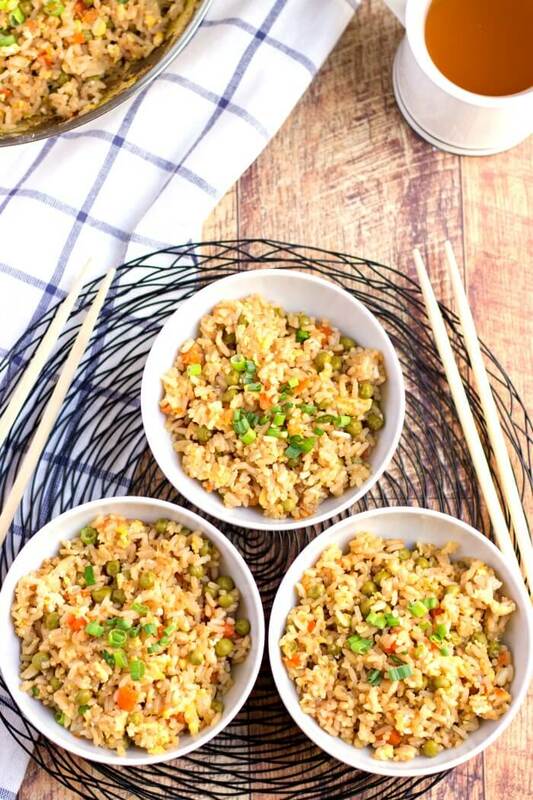 I love homemade fried rice and love love the idea of adding sriracha! Makes it super tasty! I can’t believe how easy this recipe was to make! SO good! This looks so yummm!!! 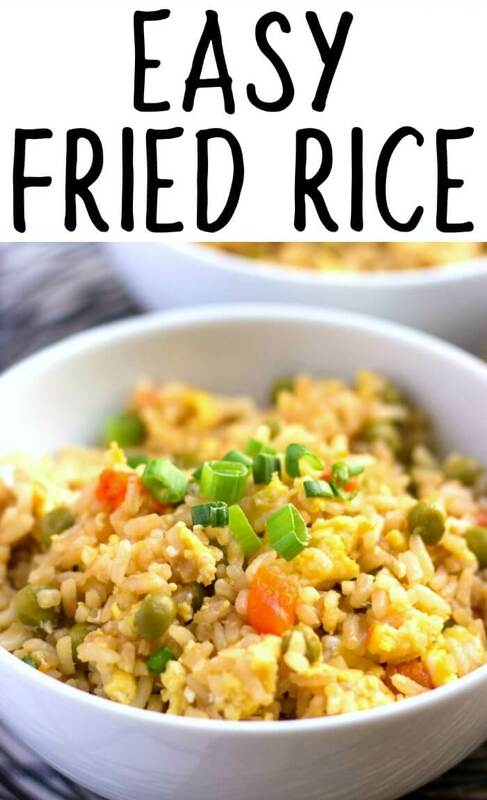 I love fried rice and your recipe is so easy to follow.